More school bells are ringing in an unprecedented year of facility openings, with more still on the way this year, says Calgary’s public school board. Over the last two months, the Calgary Board of Education has opened five new schools, one replacement school and completed a modernization project. This school year so far has seen 15 new facilities welcome students, with three more set to open in the next few weeks. This is an exciting time for students and staff as they settle into their new schools that are full of light, open and adaptable spaces and equipped with modern technology and furniture. Prior to their openings, educators and students set to attend the new facilities had been operating under a “school within a school” model since the beginning of the year, allowing them to form communities in existing schools before making the move en masse. Along with the three schools to open early this year, the 18 new facilities provide space for 6,000 students, primarily in swiftly growing suburban communities. The price tag for the new schools and modernizations on the CBE wish list is more than $500 million. The public board is at various stages of building five more new schools, as well as two major modernization projects at James Fowler and Lord Beaverbrook high schools. 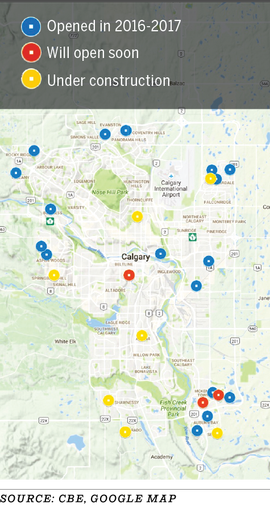 By 2018, the province is to complete 46 new Calgary schools and modernization projects.